Did you know that you can create social media posts all day, travel AND get paid? Sound too good to be true? Well, it’s not. Read on to find out exactly how it’s done. media update’s Christine Gerber shows you how to build your social media career while travelling. If you’ve dreamed about working for a company abroad, you wouldn’t be the first. How cool would it be to just take your laptop and have wherever you’re sitting be your office? The answer is very cool. And that dream could be a reality – if you plan it correctly. Although there are several careers that incorporate social media that you could look into, they’re not all realistic. Travel blogger? Unless you’re already travelling and you’ve built up an audience, forget it. Starting your own business? Maybe … once you’ve built up the correct clientele (that should be easy, right? WRONG). But did you know you can do the same job you’re already doing and still end up in Paris? Or even Tokyo? Wherever you decide to go, you need to plan ahead first. Many opportunities for travel are available to social media managers, specialists, consultants, freelancers, etc., all you have to do is decide which career you’d like to pursue. If you already have a background in any of these fields, all the better! If not, there are various courses you can take to help you get where you need to be. Still unsure of the direction you’d like to go? Search on platforms like LinkedIn to get an idea of what other nomads do. Seriously – just type in the job profession you’d like to get into and have a look at their experience and what they’ve done to get where they are. This will not only inspire you, but you might pick up a few helpful connections along the way (see Step 3)! Another option is to specialise in one particular social platform. For example, if find that you excel more at visual content than textual (and you just love photography), you might decide to become an Instagram marketer or even an influencer for a brand. Once you’ve decided on a job, then the next two steps will be a piece of cake. You – yes, YOU – have the potential to be an influencer. Find out how in our article, How to become an influencer – A 10-step guide for social media. If you’re already in a social media career that you’re passionate about, you don’t necessarily have to leave the company you work for. There are various ways to convince your company to let you work remotely. Make sure you have all of your details about working remotely ready. This should include your reasons for wanting to work in the country of your choosing, the cost of you leaving, your salary, the effects on production, your channels of communication (Skype, WhatsApp), etc. If there are any negative implications of your leaving, be sure to bring them up and explain how you will overcome them. For example, let’s say that the overseas accommodation doesn’t have Wi-Fi. You could offer ideas of how you would still be able to get your job done (i.e. by going to a coffee shop or library) by working in a space that actually does. You want to be prepared for any questions that may come up – and not be caught off guard if your company comes up with a hurdle you’re unable to jump. 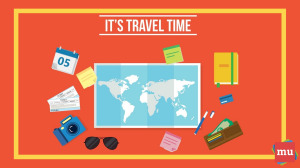 It’s important to showcase how your travels will benefit your company – why should they pick you over someone who works in an office? This is a great – and probably the only – time that you’ll be able to toot your own horn, so to speak. Bring to the fore all of your accomplishments, including things like how your company’s ROI has improved since you’ve started, how many followers it has gained, etc. Explain how expanding your personal following overseas can create beneficial connections for your company’s brand. Connections are important to any business, and if you’re able to help your company’s network grow, then more power to ya! Now it’s time to seal the deal. In order to put your company’s mind at ease, propose a trial period so that they can see if travel is at all feasible for the business. This way, you’ll both have the safety net of knowing you can opt out if anything goes wrong. Be sure to set a time frame for the trial if your company agrees, and set up a meeting afterward to provide feedback on how it went and if the trial will turn into anything permanent. Sometimes the best way to get something done is to go straight to the source. You want a travel job in social media? Then maybe you should connect with other social media nomads … on social media. Seems like a no-brainer, doesn’t it? A great place to start is your social profile. You need to ensure that your profile is business-ready (aka professional) yet still interesting enough to gain traction. You still have to work on building your own following though. And quite a big one, at that. Yes, there will be some people who see your profile and think your posts and images are cool, but you also need to connect and interact with other cool people. This means engaging with their posts (likes, shares, comments, reweets, etc.). Interacting with the right people – and the right companies – might even get you your dream job. Any social media expert knows that in order for their posts to stand out, they need to have a great style guide. Learn how to create your own in our article, How to create a social media style guide: A brand's recipe for success.